Like so many families, in ours the holidays are a time for celebration, togetherness, and lots and lots of eating. Our Christmas eating usually includes rich treats, like phyllo-wrapped tyropitas and Christmas morning cinnamon rolls. 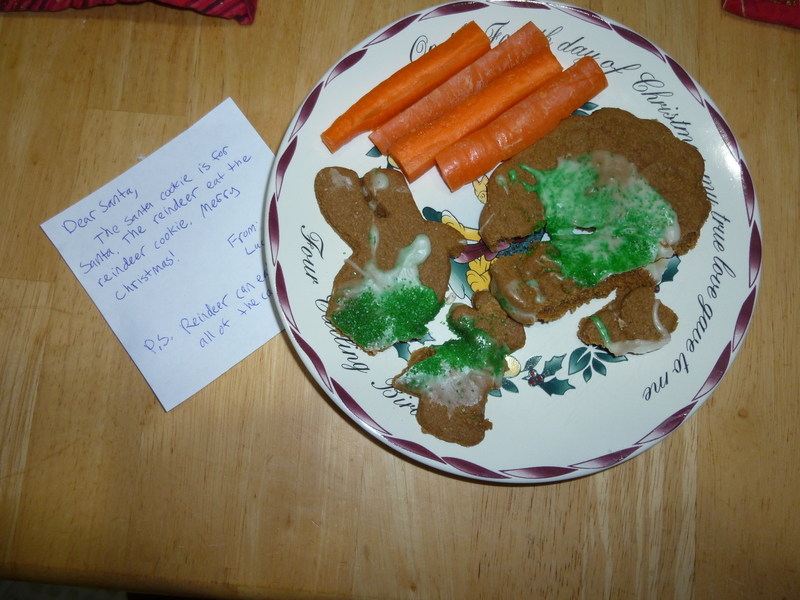 Treats for Santa and the Reindeer. LP made sure to leave a note so they knew which one was which. With all these goodies around, we try to make our actual meals enjoyable, but also a bit on the lighter side. This year I experimented with a Butternut Squash Soup that fit the bill. Mmmmm . 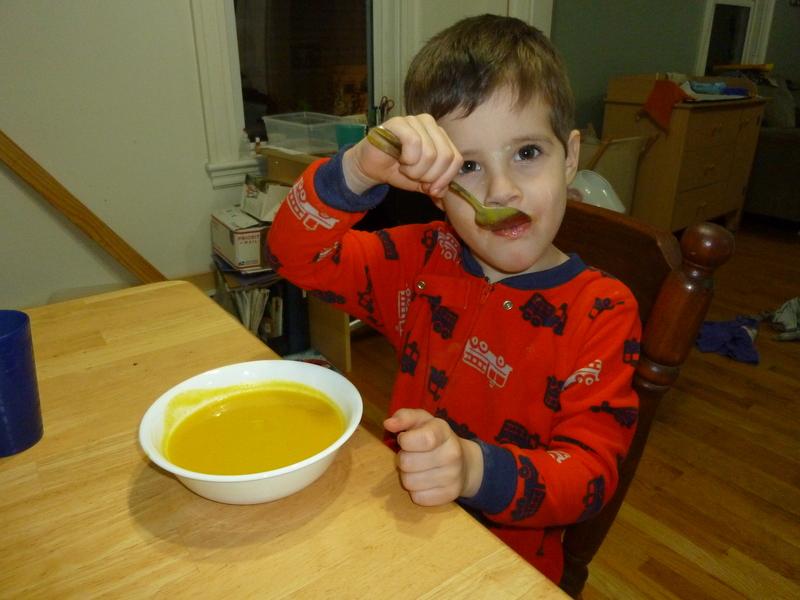 . . eating soup in jammies! This soup is not as thick as my Potato-Leek or Carrot Ginger, but it is still a filling, creamy soup that pairs beautifully with a green salad and maybe some whole-grain bread. It takes a bit more time than some soups because of the caramelized onions, but trust me, it’s so worth it. Frankly, caramelized onions are always worth it. 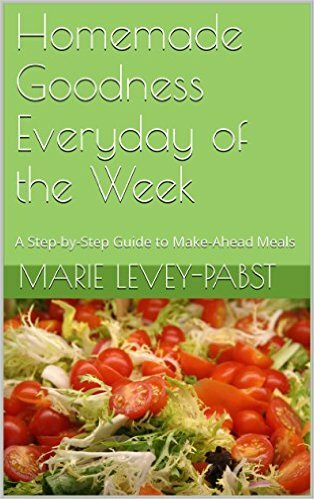 So, take the time and enjoy this soup that is perfect for the busy, fun-filled holidays, or even just for a quiet meal at home. 1) In a large saucepan, melt the butter on medium heat. Once the butter is melted, add the onions, cover and cook on medium for 5-10 minutes stirring occasionally. You are just starting to sweat the onions a bit. 2) Now remove the lid, turn the heat to medium-low and stir in the sugar. You are going to caramelize the onions, which takes a bit of time, but doesn’t require much work. Let the onions cook in the pot for 20-40 minutes. Stir them gently just once or twice. You want them to get a dark golden-brown color without burning. While the onions are caramelizing, it is a great time to chop up the squash, or get some dishes done while you keep and eye on the onions and enjoy the delicious smell! 3) Once the onions are caramelized, put in the cubed butternut squash and stir it around a bit. Add in the veggie broth and bring to a boil. Lower the heat, cover and simmer for 20 minutes, or until the squash is easily pierced with a fork. 4) Once your can pierce the squash with a fork, pour the soup into a blender and blend completely. You can also use an immersion blender for this if you have one. 5) Return the blended soup to the saucepan. Add the milk, salt, pepper and nutmeg. Stir to blend, and then taste – adjust seasonings to fit your preference.